Every farm is different in many ways, including the technology they choose to use. Some farms choose not to use modern technology, like high-powered combines or chemical spreaders, but instead still plant their fields by hand, use only animal manure on their soil and use horses to plow, cultivate, and harvest the crops. Many Amish farmers choose not to use large machines on their farms, but use horses instead. 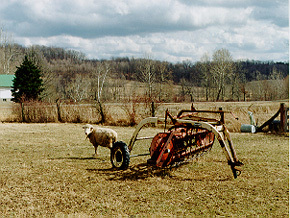 A plow rests in the field after years of use. Some people on the other hand, choose to use many of the new technologies available to them. This combine, for example, is one of the most expensive and technologically advanced pieces of farming equipment available. A combine is used to harvest the crop when it is fully grown. 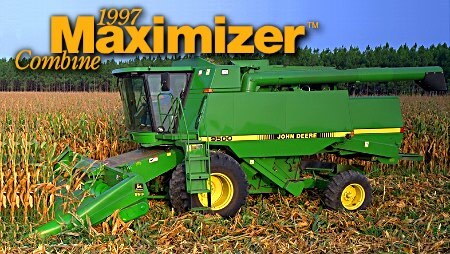 Photo from John Deere, Inc.
Let's go buy a combine! Now that you have a new combine, you should learn more about technology.